Opened 1895 as summer theatre. Later renamed "Folketeatret" [People's Theatre]. The complex included the restaurant "Rosenhaven". Used as soldier's home during German occupation in World War II ("Deutsches Haus"). Re-opened as cinema "Folketeatret" in 1948. Closed 1995. Re-opened as "Teaterhuset". The complex is home to Den Fynske Opera, Teater Momentum and the Nørregaards Teater children's theatre company. 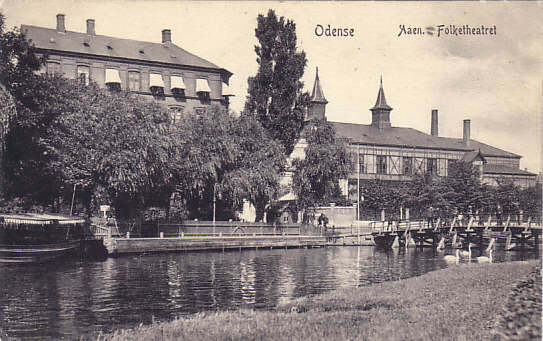 Front Text: "Odense Aaen. 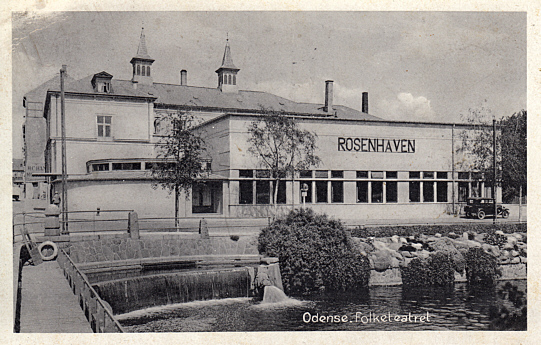 Folketheatret"
Front Text: "Odense, Folketheatret", inscription: "Rosenhaven"